Kacyiru is the area around the road stretching from Top Tower down to the US Embassy and a bit beyond, spreading down the hills on either side of the main road. It’s an area with loads of NGO, UN, and government offices as well as a bunch of embassies. This means that office types are roaming around everywhere and you’ll find the local cafes and restaurants here packed during lunch time. The main landmarks in this area are the US Embassy, the Umubano Hotel (Novotel/Laico), the KBC shopping complex (which is being torn down but is still a well-known landmark), and Top Tower Hotel. President Kagame’s very strictly guarded offices are also here and you should take note that vehicles, including motos, aren’t allowed to stop along the whole stretch of road in front. 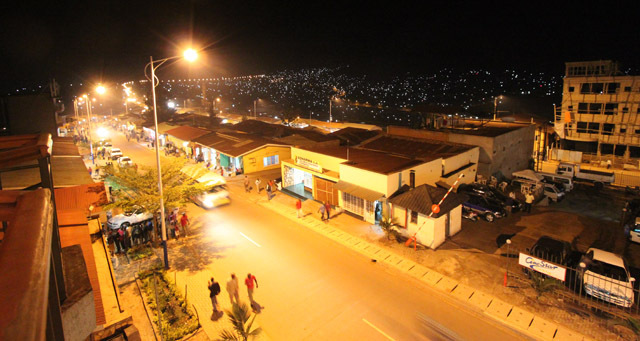 Kacyiru is a pretty handy place to live as it’s in between town, Kimihurura (bars and restaurants), and Nyarutarama (MTN Center). One major downside to the area is a lack of grocery shopping options or even corner stores. There’s also a bunch of construction at the moment as a new major road is being built. There are a few ridiculously expensive service apartments with great views located in the centre of Kacyiru but at around $2,000 a month, you’d better hope your employer is making your rent payments. For mere mortals you’ll find some housing tucked away on either side of the main road that stretches between the US Embassy and KBC. Shared housing aimed at expat types is available but you can also find some cheaper deals if you want to go more local. 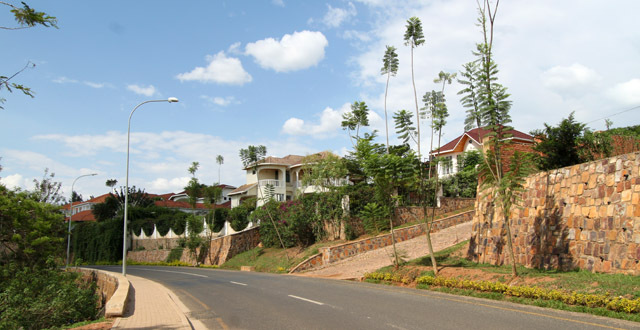 A friend was spending Rwf 100,000 a month for a simple house with one roommate down a hill close to the US Embassy (albeit about 4 years ago so expect higher prices now). Or you can find places with all of the modern conveniences for closer to $350 and above for a room in a shared house. If you’re in town for a short amount of time, there are a few hotels scattered around including Umubano and Top Tower Hotel which are both fairly dated-looking and pretty expensive for what you get. Take note that the Discover Rwanda backpacker’s hostel has relocated to Kimihurura due to that entire area being flattened to make room for that road. Kacyiru is filled with office buildings and a few hotels but it doesn’t have much in the way of shopping. The best bookstore in town called Ikirezi and is located on the road behind the Dutch Embassy (it shares its space with the Inzora Rooftop Cafe) and it’s also a good place for art supplies and gifts. There are some small shops near Umubano Hotel and there are a couple of stores near the old location of KBC. Your best bet for groceries is the One Stop store that has relocated across the road from its old location under Great Wall (which was also torn down) to the same building as the new Tangren Hotel. Kacyiru has a decent amount of different types of things on offer. If you want some sporty action, try visiting the pool, gym or tennis courts at Umubano. If you like to gamble, there’s a casino located inside the Top Tower Hotel. It’s actually a fun night out if you don’t mind being surrounded by sad looking, old Chinese guys. But if you can snag a blackjack table and fill it up with friends, it’s a relaxing and fun way to lose some cash. There are some walking paths in the valley between Kacyiru and Nyarutarama which can be fun to explore on a nice day. There aren’t a lot of nature spots in Kigali so, while small, it’s nice to have this option if you want to escape the city streets. If you’re looking for a massage or some other pampering after your walk, you can head to Soothing Corner Spa who will take good care of you. It’s probably the artistic centre of Kigali with several galleries including Inema Arts which has grown into the most successful gallery in Kigali. Ivuka Arts is Kigali’s oldest gallery, and the Niyo Gallery is newer and also located in Kacyiru closer to the US Embassy. The Kigali Public Library is also here with the Innovation Village on the top floor and both host interesting events. While this doesn’t exactly fall into the entertainment category, the innovation space K-Lab is located on the top floor of the Telecom House building in the centre of Kacyiru. They sometimes host interesting talks and events or just stop in for a visit to take in one of Kigali’s best views. With so many office workers roaming around, lunches in Kacyiru are a busy affair. If you’ve been in Kigali for any length of time and know people who work for major NGOs, the UN, the EU or the Rwanda government, you’re bound to know someone each time you eat lunch in this area. Brachetto – This is one of my favourite restaurants in Kigali for the cozy atmosphere, good wine selection, nice lunch buffet, good dinner menu, and, most of all, their amazing chocolate mousse. Run by an Italian chef-owner. Brioche – This cafe chain with three locations opened its first one in Kacyiru in the KCB building that’s in the process of being torn down. They’ve moved to another spot in Kacyiru above People nightclub that’s much more spacious but has all of the usual Brioche deliciousness that we’re used to. Cafe Neo – This cafe came on the scene a few years ago and became many people’s favourite place for coffee and meetings. They have food but the focus really is on a good cup of coffee. There are always people meeting here and working on their laptops and it’s the kind of place that doesn’t mind you sticking around and becoming part of the scenery. Georgie’s Grill & BBQ – This restaurant, sometimes referred to as ‘Car Wash Two’ has been around for years and is known as a good place to come for nyama choma. Harry’s – This restaurant located inside the City Blue Embassy Row Hotel is known for having a good lunch buffet. I’ve only eaten here once and I was impressed both with their menu (they have nachos!) and food. They also apparently have BBQs and music in their large and inviting garden. Indian Chef – Pretty average Indian food at a good price. Located on the same street as Select. Inema Cafe – This cafe is located inside the Inema Art Gallery and is the creation of Chef Carlos who used to operate the popular Paladar Venceremos from his house. He changed locations but he still offers up some great soups and sandwiches in a fun environment. Inzora Rooftop Cafe – This is one of my favourite cafes due mainly to the friendly owner and the fact that they have the best cookies in Kigali by far. They also offer a delicious yoghurt and granola breakfast option and the hot chocolate is another of my favourites. This place is busy so get there early to snag a seat and be warned that, if it’s sunny out, it can get really hot. There’s a small kiddie’s play area which makes it popular with families with young (sometimes screamy) kids. Japanda – I’ve been told that this Japanese place is the real deal by people who know Japanese food much better than I do. I really enjoyed my lunch here and now apparently they’re also open for dinner from 6 to 8pm. Kabana Club – This low-key place is one of the few spots in Kigali that sort of feels like a North American-style bar. It has a nice atmosphere and good pizza and it’s a good spot for a few beers before heading off somewhere else. Magda Cafe – This is one of Kigali’s older cafes and a good place to come to get some work done outside of the busy lunch hours. It’s pretty much a carbon copy of the Bourbon Coffee shops with almost the same menu and even the same dishes and furniture. They do the best iced mocha in town and I think the food is slightly better than Bourbon’s. Meze Fresh – This is one of Kigali’s most popular restaurants, especially for deliveries from Hellofood. Meze Fresh brought Mexican food to Kigali and oh how the people here rejoiced! The atmosphere is a bit sterile but the food really is very good and it’s fast! Select – Located on the road that goes towards Nyarutarama, I’m not really sure if this counts as Kacyiru, but it’s close enough! Select was always one of the nicest restaurants in town but I haven’t been in years so I’m not sure if it still lives up to its reputation but when I went it was great. If you want some good food and wine and don’t mind splashing out a bit (not crazy expensive but expensive for Kigali) then I’d recommend it. Great service, food and a nice view from their balcony. Shokola – The Shokola cafes have shifted around a bit over the years but it seems like they’ve settled on their location in Kimihurura and this beautiful spot on top of the Kigali Public Library. It’s a cafe that, while pricey and sometimes hit and miss with the food, does really amazing smoothies and has a great atmosphere and an even better view. Umubano Hotel – There’s a small bakery type place in the lobby with some of the best bread you’ll find in town and cakes. There’s also a restaurant which has a good (but expensive) buffet with a nice salad bar option and good a la carte food. Kacyiru is kind of a quiet neighbourhood with more of a focus on offices and important people residences but there are a couple of options for those of you who like to party. Georgie’s Grill & BBQ – This bar/restaurant hosts karaoke with Carol, a popular MC here who hosts nights four nights a week. Fridays she brings her karaoke show to Georgie’s. Inema Cafe – This cafe hosts a very popular cocktail night with a happy hour from 6 to 7pm where the drinks and beers are two for one. People will roll in from 6pm and keep the party going until around 10 or 11pm and it makes a fun place to see lots of familiar faces before rolling on to Le Must in Kiyovu or Plus 250 in Kicukiro. People – I’ve never confirmed this but I’ve heard a few times that People was opened by the same people that owned Planet Club at KBC. With KBC getting knocked down and rebuilt, People is now the only choice in Kacyiru for late night clubbing style fun. I’ve only been once but I had a fun time. There’s a smallish dance floor area and it was pretty lively the night I went. They usually charge a cover. especially if you remember to rename it Kiyovu, and then fly the entire area to the hill by the city center…! yay! Hey, I’ll be doing an independent study project starting the first week of november and need somewhere CHEAP to live up until Dec. 12th. I saw the prices in the hostels on one of your other articles, but i was wondering if that’s monthly or weekly? Do you have any suggestions as to where to find cheap apts or hostels. Prospectively might be living with 2 or 3 people, by the way. So any suggestions? Hey I am going to be moving to Rwanda for work. I am going to stay there for about 6 months and am looking for an apartment. I am going to be working on Boulevard de la Revolution and would like to rent a place closeby. It would be great if you could give me some suggestions. What is the best home internet to get in Kaciyru? This could do with an update – there’s also the National Library now, plus Brioche and People Night Club. Novotel (or whatever it’s called now) buffet is nice, and Café Blue does an affordable spread with free wifi for customers. Ikirezi bookshop and Inzora café are just behind Top Tower, too. Amazing place, loads of books in English, French and Kinya. And, yes, very safe due to all the embassies – except when people are protesting outside an embassy, like the UK last year. Then it can get a bit crowded, but usually peaceful. Also pretty good on the water/electricity front. Not without hiccups, but better than anywhere else I’ve lived.